The Bishop of London said that every wedding is a royal wedding … so here we are. 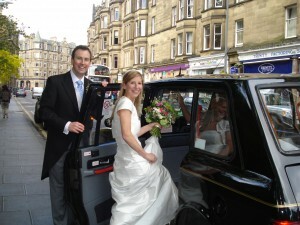 Simon and Hannah got married in Christ Church, Morningside. The landau and the horses seemed to have gone off elsewhere – so they hailed a taxi to get to Dovecot Studios. And for some reason a fire engine appeared in the middle of the Reception. So they hopped in and were photographed in that as well. A very happy day and a good time was had by all – the young at heart returned to their flat at midnight and the party continued.